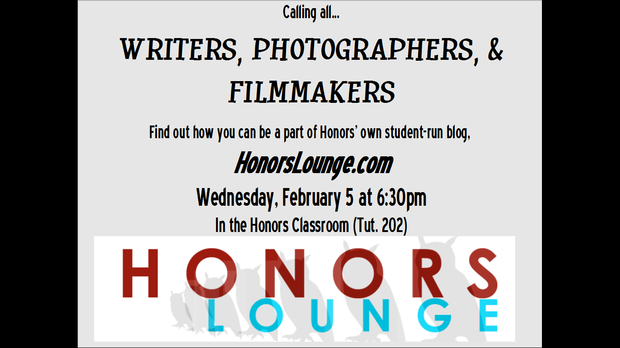 HonorsLounge.com, the blog run entirely by Honors students, is looking for more talent like yourself. If you are a writer, photographer, or filmmaker interested in being published on the web, or working as part of a team of creative individuals, HonorsLounge hopes you’ll come aboard. All those interested are invited to attend an informational meeting on Wednesday, February 5 at 6:30pm in the Honors Classroom (Tuttleman 202). We’ll tell you how you can contribute. Anyone interested but unable to attend the meeting may contact the site editors Tyler Horst (tmhorst@temple.edu), Christina Betz (christina.betz@temple.edu) or Connor Page (cjpage@temple.edu).